It was an effort to get this shot. But it was the right season to do it. I always looked north from Plaza de las Armas at two peaks that reminded me of camel humps. I knew they would provide a wonderful vantage point of Álamos and surroundings. Chon, my guide, and I started up a trail early on an overcast morning. Two others, possibly miners, with a supplies burdened burro, were ahead of us. High up, they took a fork in the trail to the east and we continued climbing to the west. In late spring, the summer jungle is bendable bare branches. I was hoping the sun would break through. It didn’t. We reached the top under cool cloud cover. I would later learn this was a blessing. I began to film. We now go back in time to this moment contemplating the big picture. Timeless. 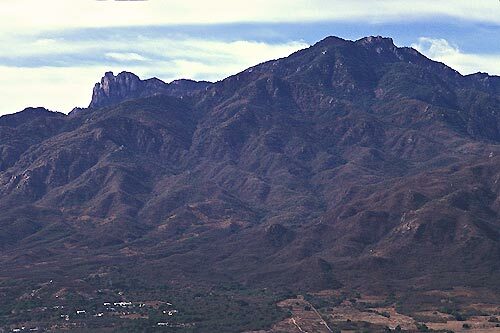 Sierra de Álamos towers over the village wiping sleep from its eyes. To the immediate south of Álamos is the Sierra de Álamos mountain island. It runs east-west, perpendicular to the coast and the Sierra Madres. It has always taken me and my guides several hours to reach the top from the Plaza de las Armas. The most comfortable time to start is the cool pre-dawn hours. 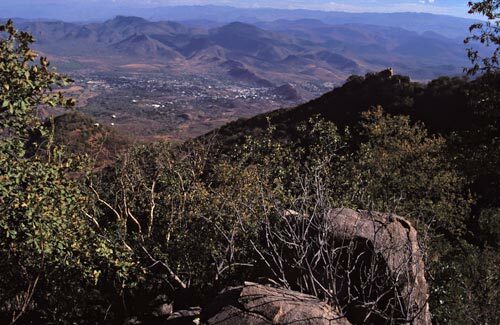 Good morning Alamos from Gringo Point in the Sierra de Alamos. A week later, Chon and I spent two days and a night atop Sierra Álamos. Gringo Point is a rock outcropping that looks down directly on Álamos. Truly a bird’s eye view. Again, overcast persisted. But what can one do but do what one does? One can almost hear a 1,000 silver mule train leaving Álamos south. Chon created a fire in the high altitude morning chill, a bed of embers no wider than his palm with a flame no longer than his thumb, and brewed me a cup of tea. I unpacked three bags of camera equipment and began to film. We did not talk. Below, a church bell persistently called for morning mass. And we could hear the past that becomes today and will be tomorrow. I have never forgotten that civilized cup of tea. Pine trees rustle in the wind and parrot calls echo off stone canyon walls. 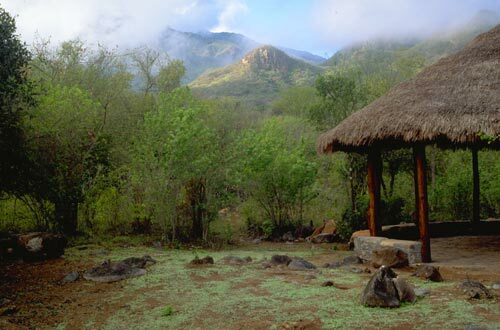 Pine aromas in a dry tropical rain forest, with tea in hand, is truly a top-of-the-world experience. I felt safe with Chon guiding the way. it is always best to travel with a guide so you don’t go where someone doesn’t want you to go. Recently, life had been hard on Chon and these moments above and beyond the village were good for his spirit. And I was thankful for the opportunity to capture scenes from the highest vantage point. of the giant fig tree. Chon took pride in doing a job well and enjoyed a good joke and a cold beer. We come and go, in the short term, like the birds and in the long term as do mountains. 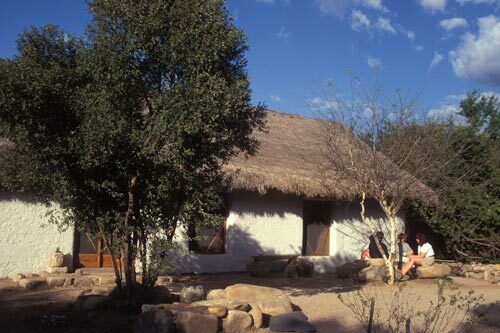 the strawbale casa on El Pedregal in Álamos, Sonora, Mexico. Chon portrait by Kit Nuzum, 2015.
every moment history, every scene a moment. We are all part of the river of life. A summer return to the northern rock outcroppings. One of 1996’s summer-photo-expedition goals was to return to the camel humped rocks. Local photographer Antonio Figueroa joined me on an effort to repeat the spring shoot. We knew summer heat and humidity would challenge us. We set off early in the morning. When we left the trail at the base of twin peaks we ran into a dense jungle of tangled vines, limbs, overgrown brush, stickers… We couldn’t get to the top. The air became hotter, oppressive, as the sun climbed into a watery sky. We had to return without our photos. Talk about disappointment, but it was what it was. And it would become worse. On the way down, Antonio ran head first into a hornet hive. 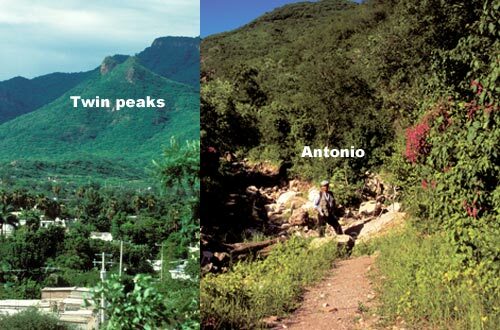 If you could see Antonio’s swollen face in the photo on the trail you would realized his pain. As soon as we reached Alamos he went to the hospital for treatment. A tough day was had by all, but none tougher than Antonio’s attempt to capture the big picture. Jungle one – photographers zip. Mt. 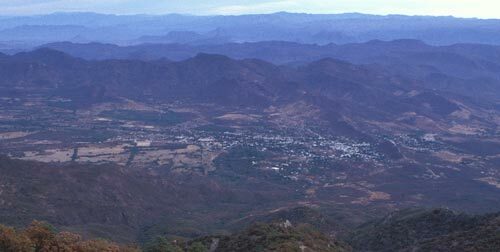 Alamos is some 6,500 feet above sea level. 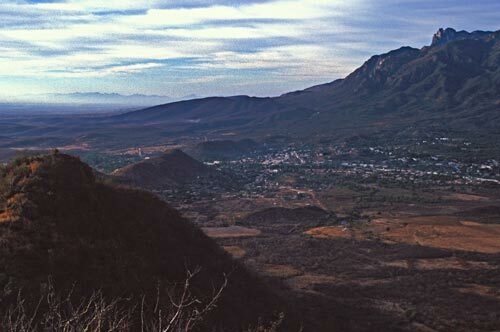 It towers 5,000 feet above the town of Álamos. It is another world, wild parrots, dry tropical forest, granite and… Up and down is a day’s effort, it is well worth it. To reach the top it is recommended to start hiking early while it is still dark and cool. In a magnificent setting there is this fig tree to admire and celebrate. Pember and Elizabeth Nuzum owned a lot off a dirt road in the Chaleton area, place of the fig trees, west of Alamos. They planned to built a tennis court on it. One day Elizabeth traveled further west on the road and came across this fig tree. It was love at first site. 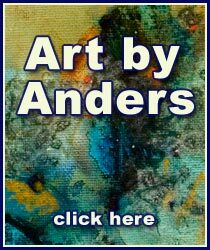 She coaxed Pember into selling their lot, and it sold unexpectedly quickly. Elizabeth, on her own, purchased the undeveloped three acres with the fig tree from Martha and Al Haywood. Elizabeth christen the property El Pedregal, the stoney place. This was her project, her experimental place to build and plant what she wanted. 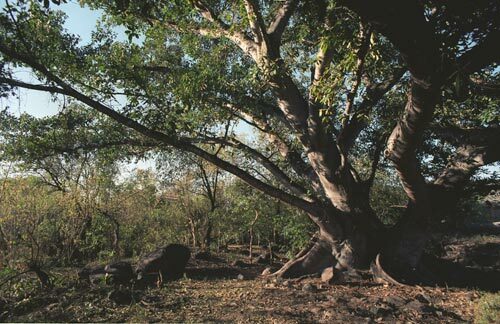 It was her dream to bring art, community and nature together under the out-stretched limbs of a magnificent fig tree. Elizabeth loved her big green door that was El Pedregal's entrance. The first thing Elizabeth did at El Pedregal was build a meandering road leading through and around the property to the fig tree. 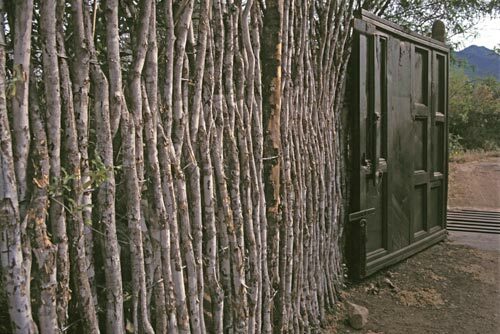 The heavy green gates at Pedregal’s entrance, where the public dirt road comes to its end, were made from old doors Elizabeth collected in town. 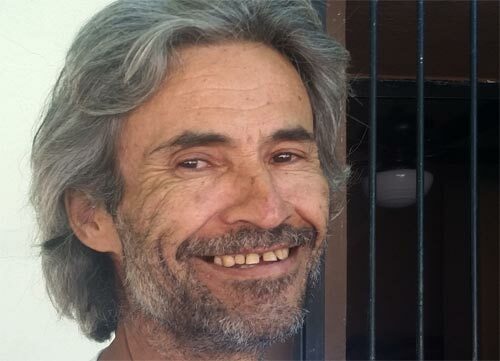 She had put them together by Nemecio Figueroa in his family’s carpenter shop on the way to the Panteon, cemetery, at the eastern edge of town. Behind these green gates there were, and are, worlds of natural wonder. The seasons pass as birds, insects and mammals come and go. 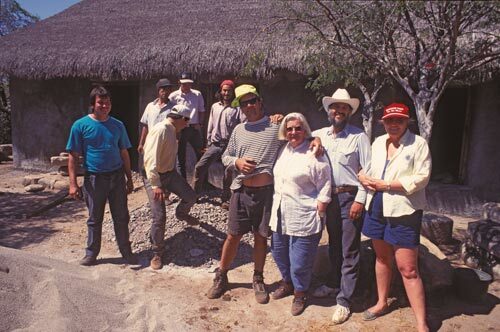 Elizabeth Nuzum wanted to build a straw-bale house in Alamos. She did. Elizabeth had read the book Out on a Limb by Peter and Victoria Nelson. It was about tree houses and other construction such as straw-bale houses. Elizabeth decided she wanted to build a straw-bale in her garden of experiments. She contacted the Nelsons as they were preparing to visit Russia and demonstrate straw-bale technology. They recommended that she talk to the authors of The Straw-Bale House, Bill and Athena Steen. 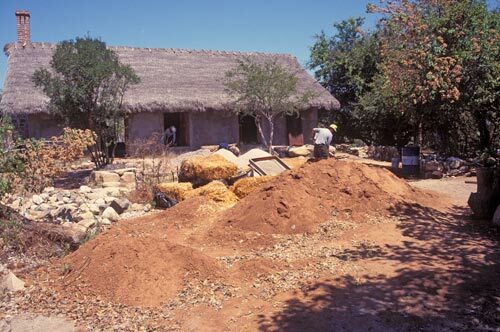 Elizabeth felt it was important to build a straw-bale structure as an example of what could be a relatively inexpensive home concept for Mexico. Unable to have an expert come down to build the straw-bale studio she relied on the Steen’s book and hired her son-in-law Chacho Valdez and his brothers to start the project. 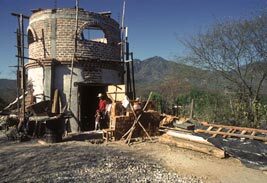 Chacho would build the basic structure: roof, walls and an unfinished floor. 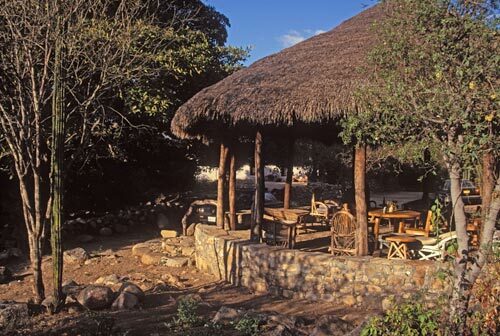 The Palapa was the first structure built at El Pedregal. It was a work office. Before the Straw-bale studio was started Elizabeth and Chacho took a stick and scribed out a large circle as the palapa’s floor-plan. Her intent was to have a place where people could socialize and admire the fig tree. She wanted it to have two entrances and no center pole. Chacho said it could be done and he went about construction. 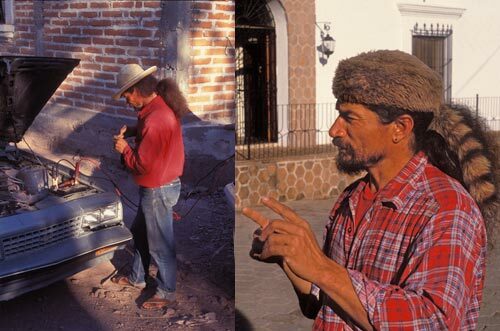 Chaco Valdez, renaissance man, making a spiritual point and jump starting a car. 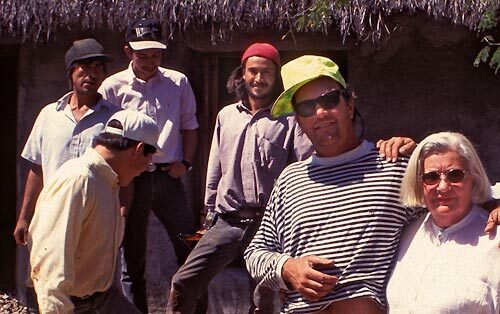 I always thought of Chacho as a rock n’ roll medicine man. He looked like a pirate with long flowing hair and beard, bandanas and hats. One day Chaco looked at me with one eye somewhere else and stated, ”if you stare at a cloud long enough it will disappear…” This is an anthem-theme that I use whenever I speak of Alamos. Here is a place to come together and be a warm late afternoon dream. Liliana Carosso, on the right, and Ginny Brown, along with an unidentified woman in the middle, enjoy a natural moment. Lilliana is a prominent Alamos real estate agent. Here, one is in another world. Time loses importance and nature, and a couple of beers, encourages relaxed deep breathing. Elizabeth’s son, Kit, returned from one of his many global travels and took over the task of finishing the straw-bale studio. He also managed the digging of a well at the spot chosen by a water dowser. A solar pump was installed and irrigation began with water from beneath El Pedregal”s surface. Elizabeth purchased indigenous and rare trees and plants. And as the nature is for these parts some took, and some didn’t as any Alamos gardner has experienced. Most of construction team and advisors gather around Elizabeth Nuzum. Kit had no prior working knowledge of straw-bale construction and “just went for it” with the help of Chone, a cousin of Chacho. 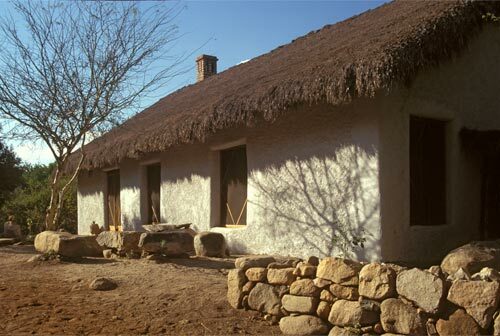 They poured an earthen adobe floor with the help of Steve Frielobs. The windows were made by Angel Rosas. The adobe interior walls that made the kitchen and bathroom was there but unfinished. Kit and Chone, along with several others, finished the walls and the loft decking as well as the grand stair case, designed by Alamos resident Irmine Stelzner, with wood from the old Boors monastery on the southwest corner of the Plaza. The original douglas fir came by train from Oregon in 1910. Irmine’s husband Allen Stelzner designed and made the iron latch on the front door. The finished exterior blended in with the surroundings. 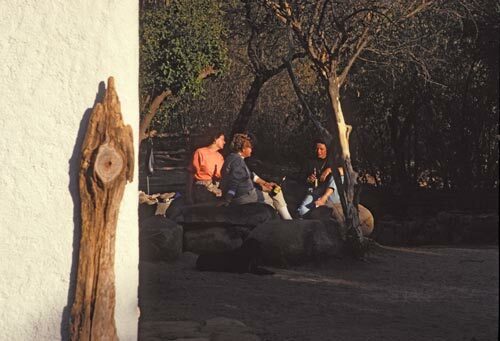 Elizabeth’s straw-bale studio was originally painted with a palette of colors made from dirt in the surrounding hills. The soil that would be used to make the paint came from a spot that was along a long walk that Chacho took me on the last day of my first visit to Alamos. Chacho said it was a local custom. As we were returning to Alamos I asked Chacho if the earth was purple and he nodded yes. In this one area there was literally a rainbow of dirt. Fifteen years later, Kit and I, along with a couple of assistants and a wheel barrow, set off to find this magical place. We found it not far from El Pedregal along with shards of am old pottery. The work crew spent the morning gathering earthen colors from the area as I filmed. Later, Kit mixed the earth-toned dirts – pale green, red, blue, green, ivory, white and lavender with prickly pear and agave goo called baba. The solution sat for a week before glue was added and wiped onto the interior walls: home made paint. Later, author Paul Molyneaux, seeking a quiet harbor from his noisy young children, finished his book The Doryman’s Reflection, a Fisherman’s Life in the serene straw-bale studio. Tony Estrada, director of the Museo de Costumbrista and artist, sculpted a centaur for Elizabeth that was placed beneath the fig tree. The morning begins with seeing where we will be in a couple of hours. 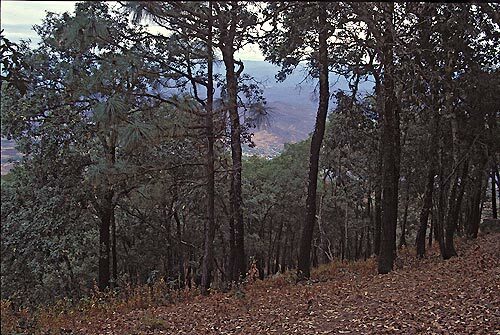 On this summer day in 1996 I would go on a hike with Chacho, his young son Sereno, his girlfriend and Chone to the top of Tecolete Hill, seen here sun-capped. Sierra de Alamos rises up in the background. 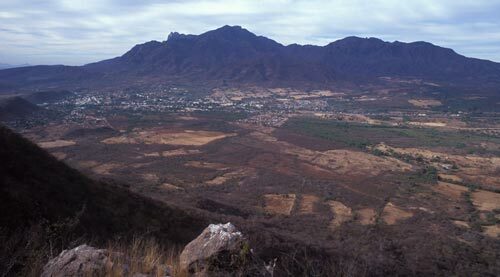 We would leave from El Pedregal at sunrise and be atop Tecolote Hill in a couple of hours. This turn out to be a day of exercise and aroma therapy in Alamos, Sonora, Mexico. Elizabeth sold El Pedregal to Jennifer and David MacKay in 2005. They added another 17 acres to what is now El Pedregal Nature Lodge and Retreat Center. They have also upgraded the infrastructure and added a couple of casitas. Today, they offer lodging, nature tours, sunday brunches and yoga lessons amongst many other activities that they are involved with. I recently enjoyed watching David Wilson’s Big Birding Day on PBS’ POV, point-of- view, series. The 2011 12-minute film features David Mckay as a birding guide for several birders intent on a big birding day. The film documents the world of competitive bird watching where one tries to see, or hear, as many bird species as one can in 24 hours. The opening scene takes place under the Pedregal’s palapa as they prepared for a day of ambitious adventure. I was struck by David’s curiosity and connection to his environment. I had spent nine years filming wildlife on the Tulelake, Lower Klamath, Clear Lake, Upper Klamath Lake and Klamath Marsh National Wildlife Refuges along the California-Oregon border. If David had come and spent a couple of days in the field with me he would have had a wonderful time. And I am equally sure I would enjoy spending a couple of days with David Mckay in Alamos and surrounding habitats. Both of these regions are known for diversity of flora and fauna, especially numbers of bird species. There are birds that visit both Alamos and Tulelake on their yearly migrations. 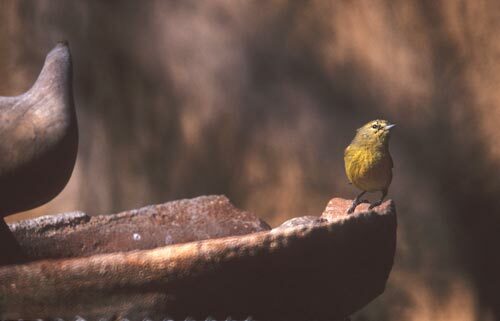 Elizabeth Nuzum placed this bird bath on Pedregal’s giving ground for her small friends to use, just as she built the straw-bale studio and palapa for friends to visit with friends, even if it is only communing with one’s self, alone. This entry was aided by notes from Elizabeth Nuzum, Kit Nuzum and Joan Winderman. This page took 0.345 seconds of computer labor to produce.